Resilience is known to predict mental health, with evidence suggesting that positive coping strategies can protect military personnel from the adverse effects of stressful events. Improved resilience may thus be an important target as a defense strength against stress. Previous research indicates that resilience plays an important protective role against psychopathology and may have an ameliorating effect on psychological well-being (PWB) and that positive and negative coping strategies can affect both resilience and mental health. However, PWB is also an important predictor of physical health., In a quantitative review, for example, PWB was shown to be significantly associated with reduced cardiovascular mortality in a healthy population. Evidence also indicates that high PWB and positive emotions strongly contribute to better health outcomes and a longer life. Effective coping skills for managing military-related stressors are strongly correlated with improved life satisfaction and resilience  while coping strategies are known to predict variance in resilience. Task-oriented coping has a positive relationship with resilience, whereas emotion-oriented coping is associated with low resilience. Consequently, resilience boosting can help prevent and treat depression. Other coping styles may also be associated with different psychological distress levels, with evidence that active coping can result in lower depression scores  and that avoidant coping can significantly predict alcohol abuse. However, several studies have produced different outcomes for coping strategies in patients with posttraumatic stress disorder (PTSD). A prospective longitudinal study of risk and resilience among 122 U. S. Air Force medical personnel indicated that repressor coping strategies predicted fewer PTSD symptoms. Another study on 84 male rescue workers in Taiwan similarly showed that job experience and confronted coping are significant predictors of psychiatric morbidity while distancing, escape–avoidance, and positive reappraisal are significant predictors of posttraumatic morbidity degree. Whereas mental health refers to a state of well-being, wherein a person can use their own abilities to cope with the stressful events or adversity of their life, resilience refers to a person's relative resistance to stress. However, limited research focuses on the relationships among coping strategies, resilience, PWB, and health status in the military personnel. Nevertheless, despite evidence of convergence in constructs of resilience, PWB, and coping strategies, before this study, there had been little research into the precise relationships among the coping strategies, resilience, PWB, and perceived health status in the military population. Furthermore, despite the proven benefits of resilience and PWB in other groups, we were not aware of any study that explored the relationships between coping strategies, resilience, PWB, and perceived health in a military population. This study aims to assess relations between different coping strategies, resilience, PWB, and perceived health among military personnel. In this cross-sectional study, we assessed how different coping strategies affect resilience, PWB, and perceived health among nuclear, biological, and chemical (NBC) protection soldiers and military nurses in Taiwan. Questionnaires were distributed to the participants who met the study criteria in November 2015, and path analysis was adopted to examine the relationships among the variables of the study interest. A convenience sample was used to recruit military personnel through purposive sampling. Inclusion criteria were as follows: (1) age 18 years and above; (2) participated in NBC disaster maneuver on military exercise in the past two years; and (3) written informed consent was obtained. NBC disaster is not only a military but a medical issue that needs specific medical instruments to resuscitate lives. NBC disaster maneuver is regularly held on annual military exercise. The original sample consisted of NBC protection soldiers in Taoyuan city, the NBC force of the Northern Taiwan. Clinical nurses we recruited in this study work in the military medical center of Northern Taiwan, and the military medical center held NBC disaster maneuver annually. NBC protection soldiers were recruited from a military force in Northern Taiwan if they consented to participate in this study. The only exclusion criterion was never having received NBC training. The study was reviewed and approved by the Institutional Review Board of the Tri-Service General Hospital (Approval No. 1-105-05-109). The researcher directly approached the selected participants and explained the study aims and the importance of participation and confidentiality. Written informed consent was obtained from the participants who agreed to join this study. The questionnaires were administered to the participants preceded by an information sheet. All responses to the questionnaires were kept confidential. The questionnaire included a demographic information sheet, Ryff's PWB Scale (Ryff's PWB Scale), the Brief COPE Inventory (Brief COPE), and the Resilience Scale for Adults (RSA). Permission was obtained to use the questionnaires. The following demographic data were collected: gender, age, marital status, educational level, income, experience of NBC incident management, and working unit. In addition, perceived health status was assessed by asking “How is your health status?” and ranged from 1 (very bad) to 5 (very good). We used the shortened version of PWB Scale, which has 6 subscales of 14 items each (7 positively worded and 7 negatively worded). The 6 subscales are autonomy, environmental mastery, personal growth, positive relation with others, purpose in life, and self-acceptance. Cronbach's alpha coefficients for the six sub-scales were 0.82–0.90. Correlations of the 14-item scales with the 20-item original scale range from 0.97-0.98. Responses to each item were on a six-point format, from strongly disagree (one) to strongly agree (six). The Mandarin version of PWB Scale has been shown to have good reliability (α =0.89) and validity. The RSA consists of 33 items that measure intra- and inter-personal protective resources that may facilitate adaptation and tolerance to stress and negative life events. The Mandarin version of the RSA consists of 29 items with 5 dimensions and has good validity and reliability (α = 0.89). It comprises five factors: (1) personal strength (six items); (2) family cohesion (seven items); (3) social resources (eight items); (4) social competence (four items); and (5) structured style (four items). Items were scored along a five-point semantic differential scale. The test–retest reliability was good (α = 0.89). Confirmatory factor analysis with five factors of the scale inducted into the conclusion that the five constructed dimensions of the resilience should be kept intact. In the present study, the Cronbach's alphas were 0.86, 0.82, 0.87, 0.85, and 0.90 for the abovementioned five factors, respectively; for the total RSA score, the Cronbach's alpha was 0.95. The full COPE Inventory is a multidimensional self-completed questionnaire assessing coping in response to stress. The brief version is an abbreviated version that comprises 14 subscales for which psychometric properties are described (2 items per scale) with good validity and reliability (α = 0.50–0.90). The Mandarin version of the Brief COPE has acceptable validity and reliability in the present study (α = 0.80). The scale also combines 14 scales into two factors: approach-oriented coping and avoidant coping. The approach-oriented coping dimension consists of five facets with good reliability (α = 0.90), and the avoidant coping dimension consists of six subscales with good reliability (α = 0.74), with the exception of nonsignificant loadings for active coping, humor, and venting. Data were subsequently analyzed by path analysis to detect the direct and indirect effects between variables of coping strategies, perceived health, PWB, and resilience values. The relationships among the Brief COPE Scale, the PWB Scale, the RSA, and the perceived health were assessed using Mplus software version 5.1. Path analysis is especially appropriate to investigate the empirical and commonsense knowledge of a problem. For this study, we were interested in testing the hypothesis that the Brief COPE is directly and indirectly correlated with the RSA and the PWB Scale and that PWB predicts perceived health. Therefore, we used the statistical approach of path analysis to test the correlations for each variable. Model fit was evaluated using various criteria. The standardized root mean square residual (SRMR) was used to indicate the standardized difference between the observed and predicted covariances, and the comparative fit index (CFI) was used to indicate the proportion of improvement in the overall fit of the test model relative to a null model that has no relationships among observed variables. The indicators of model fit, for refinement of the model and stopping criteria, were as follows: (1) CFI ≥0.90, (2) root mean square error of approximation (RMSEA) ≤0.06, (3) SRMR ≤0.08, and (4) χ2/df <2. A total of 200 soldiers and nurses completed the preliminary survey [Table 1]. Most participants were male (n = 145; 72.5%) and single (n = 177; 88.5%). Ages ranged from 18 to 46 years (mean 24.6 ± 4.7 years). The mean length of work experience was 3.31 ± 1.57 years, with most participants reporting 6–12 months' experience (n = 54; 27%). Before performing the data analyses, we tested the reliability of the scales. [Table 2] presents the results of separate factor analyses for the items in each scale. The PWB Scale had good validity and reliability, with alpha coefficients of 0.72–0.88 for the subscales and 0.96 overall. The factor loadings for the six Ryff's PWB Scale dimensions ranged from moderate to high (0.55–0.95). Concerning the RSA, Cronbach's alpha coefficient was 0.95 for the total sample, and the reliability of the five subscales ranged from 0.82 (for family cohesion) to 0.90 (for structured styles). The factor loadings of the five RSA dimensions ranged from moderate to high (0.71–0.99). The Brief COPE had Cronbach's alpha coefficients of 0.90 for approach-oriented coping, 0.74 for avoidant coping, and 0.80 overall, with alphas ranging from low (0.32 for self-distraction) to high (0.83 for substance use). The factor loadings for the five subscales in the approach-oriented coping dimension ranged from moderate to high (0.68–0.79) as did all factor loadings for the avoidant coping dimension (0.46–0.83), except for a low but significant loading for self-distraction (0.32). The path model for this study is shown in [Figure 1]. The model fit statistics of the proposed COPE–RSA–PWB-Perceived Health model were as follows: χ2/df = 1.78/3, P = 0.762 CFI = 1.0, RMSEA = 0.00, 90% confidence interval of RMSEA = 0.00–0.098, and SRMR = 0.015. The proposed model fit was very good, so we concluded that the model was adequate to explain the role of different coping strategies, RSA, PWB, and perceived health. In this study, approach-oriented coping was the most significant positive factor for predicting resilience (coefficient = 0.60, P < 0.001), also significantly explaining PWB (coefficient = 0.33, P < 0.001). By contrast, avoidant coping was a significantly negative factor for predicting resilience (coefficient = −0.31, P < 0.001) and PWB (coefficient = −0.20, P < 0.001). Resilience significantly predicted PWB (coefficient = 0.48, P < 0.001), and PWB was the most significant predictor of perceived health (coefficient = 0.45, P < 0.001) [Figure 1]. Our findings show that positive coping strategies that lead to greater resilience and PWB are important for military personnel who face occupational stressors. Our conceptual model, consistent with prior literature, proposes that resilience and PWB were associated with different stress coping strategies. Moreover, it seems that improved PWB could improve the status of perceived health. We conclude that approach-oriented coping results in significant positive effects on resilience and PWB, whereas avoidant coping has the opposite effects. Previous research has shown that increasing resilience among military personnel significantly reduces the odds of them developing depression or PTSD and significantly reduces health-care costs. This is consistent with evidence that resilience plays an important protective role in protecting against psychopathology. However, although numerous studies have indicated that resilience is negatively associated with depression, anxiety, and PTSD among the military population,,, a few studies have explored the relationships between resilience and PWB. A study of 512 military service members returning from deployment was done. They showed that soldiers with higher levels of resilience, including hardiness (encompassing control, commitment, and challenge), predicted several indicators of better mental health and lower alcohol use after 6–12 months. Another study focused on the mediating role of resilience among 510 burn patients from 5 general hospitals in Xi'an. The results indicated that resilience is significantly and positively correlated with PWB. Elsewhere, a random cross-sectional telephone survey suggested that early life adversity is significantly associated with a lack of resilience resources, which, in turn, influenced PWB. Indeed, the absence of resilience among participants with adverse childhood experiences is markedly associated with poor PWB. The study results revealed that resilience significantly predicted PWB. Previous studies have indicated that higher levels of resilience predict better mental health  and significantly correlate with well-being. Only one cross-sectional study has shown a negative association between PWB and resilience among participants with adverse childhood experiences; however, this did not show that resilience was a significant predictor of PWB. Based on our research, resilience seems to have an important role in predicting good PWB in military personnel. PWB and perceived health are correlated. We showed that PWB is an important consideration when assessing perceived health in military personnel. Consistent with our conceptual path, the results suggested that different coping styles significantly predicted resilience and PWB. Although the potential positive effect of approach-oriented coping on resilience and PWB has been described in literature,, a few studies have investigated the relationship between coping, resilience, and psychological health among military personnel., Previous studies have shown that PWB strongly predicts physical health among both healthy and ill persons. However, these have also shown that further investigation was needed to understand how resilience relates to PWB and perceived health in military personnel. In our study, PWB was seen as a mediator between resilience and perceived health, with physical health (a key goal of military training) mediated by PWB. Of note, personnel who used approach-oriented coping strategies had better resilience and PWB levels in this study. Indeed, we found that different coping strategies influenced resilience and PWB in different ways. On the one hand, approach-oriented coping significantly predicted positive resilience and PWB. On the other hand, avoidant coping predicted negative resilience and PWB. In previous studies, similar results were found regarding effective coping, resilience enhancement, and mental health. Problem-solving coping is positively related to higher resilience and lower psychological distress, whereas avoidant coping is negatively related to resilience and mental health.,, Thus, approach-oriented coping, in which individuals try to eliminate the stressor and modify its external cause, was associated with improved resilience and PWB. This is an interesting finding that is consistent with the literature on the benefits of problem-focused coping. Furthermore, the result emphasizes the importance of resilience and PWB, because by having positive approach-oriented coping strategies, military personnel may develop positive resilience and PWB, which should result in a more positive perception of their health status. To date, there has only been limited research into the relationship between perceived health and PWB in military populations. Perceived health status, which is a significant indicator of morbidity and physical health, has been shown to be a strong indicator of underlying disease burden. Numerous studies have also indicated that happiness and PWB are strongly associated with perceived health , and can protect against illness. However, no study had investigated this issue in a military population until ours, and our results are consistent with those in other populations, confirming that PWB significantly predicts perceived health status in the military population. Our results also indicated that perceived health was only predicted by PWB and that it was not influenced by other coping strategies. Although PWB is a key component of perceived health, we showed that approach-oriented coping may have beneficial effects on resilience and PWB in military personnel. By contrast, avoidant coping may have deleterious effects on their resilience and PWB, which could impair their perceived health status. This suggests that interventions designed to promote positive resilience may improve PWB and that this may consequently improve perceived health in this population. It is important for the military organizations to develop interventions to promote resilience and PWB in military personnel as part of an overarching drive to improve physical health. Despite the robust design and large sample in a clearly defined cohort, several limitations should be considered. First, it should be noted that most empirical research on PWB has been cross-sectional rather than longitudinal. Future research should, therefore, seek to examine the interaction between approach-oriented coping, avoidant coping, resilience, and PWB in a longitudinal study that includes assessment of any possible moderation by resilience. Second, it should be noted that there were significant correlations between avoidant coping and PWB in the path model even though coefficients were small (coefficient = −0.2, P < 0.001). Future research should examine the impact of avoidant coping on PWB in a large military population military. This suggests that some other un-appraised variables may have been important to the observed relationship. Third, the participants were mainly young males, limiting the generalizability of our findings. Finally, the data were derived entirely through self-report measures, so the data will be subject to the usual limitations associated with this research methodology. The study was supported by a grant from the Ministry of National Defense, R.O.C. (MAB-105-073). de Terte I, Stephens C. Psychological resilience of workers in high-risk occupations. Stress Health 2014;30:353-5. Goodwin L, Wessely S, Hotopf M, Jones M, Greenberg N, Rona RJ, et al. Are common mental disorders more prevalent in the UK serving military compared to the general working population? Psychol Med 2015;45:1881-91. Callahan DJ. Combat-related mental health disorders: The case for resiliency in the long war. J Am Osteopath Assoc 2010;110:520-7. Eisen SV, Schultz MR, Glickman ME, Vogt D, Martin JA, Osei-Bonsu PE, et al. Postdeployment resilience as a predictor of mental health in operation enduring freedom/operation Iraqi freedom returnees. Am J Prev Med 2014;47:754-61. Bartone PT, Hystad SW, Eid J, Brevik JI. Psychological hardiness and coping style as risk/resilience factors for alcohol abuse. Mil Med 2012;177:517-24. Davydov DM, Stewart R, Ritchie K, Chaudieu I. Resilience and mental health. Clin Psychol Rev 2010;30:479-95. Graham C. Happiness and health: Lessons – And questions – For public policy. Health Aff (Millwood) 2008;27:72-87. Miquelon P, Vallerand RJ. Goal motives, well-being, and physical health: Happiness and self-realization as psychological resources under challenge. Motiv Emot 2006;30:259-72. Chida Y, Steptoe A. Positive psychological well-being and mortality: A quantitative review of prospective observational studies. Psychosom Med 2008;70:741-56. Frey BS. Psychology. Happy people live longer. Science 2011;331:542-3. Kees M, Rosenblum K. Evaluation of a psychological health and resilience intervention for military spouses: A pilot study. Psychol Serv 2015;12:222-30. Campbell-Sills L, Cohan SL, Stein MB. Relationship of resilience to personality, coping, and psychiatric symptoms in young adults. Behav Res Ther 2006;44:585-99. Southwick SM, Charney DS. The science of resilience: Implications for the prevention and treatment of depression. Science 2012;338:79-82. Nakkas C, Annen H, Brand S. Psychological distress and coping in military cadre candidates. Neuropsychiatr Dis Treat 2016;12:2237-43. McNally RJ, Hatch JP, Cedillos EM, Luethcke CA, Baker MT, Peterson AL, et al. Does the repressor coping style predict lower posttraumatic stress symptoms? Mil Med 2011;176:752-6. Chang CM, Lee LC, Connor KM, Davidson JR, Jeffries K, Lai TJ, et al. Posttraumatic distress and coping strategies among rescue workers after an earthquake. J Nerv Ment Dis 2003;191:391-8. Herrman H. Promoting mental health and resilience after a disaster. J Exp Clin Med 2012;4:82-7. Ryff CD, Lee YH, Essex MJ, Schmutte PS. My children and me: Midlife evaluations of grown children and of self. Psychol Aging 1994;9:195-205. Chiang HH, Chien LH, Lin JS, Yeh YH, Lee TS. Modeling psychological well-being and family relationships among retired older people in Taiwan. Int J Ment Health Nurs 2013;22:93-101. Friborg O, Hjemdal O, Rosenvinge JH, Martinussen M, Aslaksen PM, Flaten MA, et al. Resilience as a moderator of pain and stress. J Psychosom Res 2006;61:213-9. Chen SH, Wang SY. Sense of Self, Resilience and Posttraumatic Stress Symptoms of Burn Patients in Taiwan. Poster Session presented at: The 11th European Conference on Traumatic Stress. Oslo, Norway; 15-18 June, 2009. Pajares F, Miller MD. Role of self-efficacy and self-concept beliefs in mathematical problem solving: A path analysis. J Educ Psychol 1994;86:193-203. Hu L, Bentler PM. Cutoff criteria for fit indexes in covariance structure analysis: Conventional criteria versus new alternatives. Struct Equ Modeling 1999;6:1-55. Baltaci HŞ, Karataş Z. Validity and reliability of the resilience scale for early adolescents. Procedia Soc Behav Sci 2014;131:458-64. Vyas KJ, Fesperman SF, Nebeker BJ, Gerard SK, Boyd ND, Delaney EM, et al. Preventing PTSD and depression and reducing health care costs in the military: A Call for building resilience among service members. Mil Med 2016;181:1240-7. Kim J, Seok JH, Choi K, Jon DI, Hong HJ, Hong N, et al. The protective role of resilience in attenuating emotional distress and aggression associated with early-life stress in young enlisted military service candidates. J Korean Med Sci 2015;30:1667-74. Edward KL, Ousey K. The role of resilience in rebuilding lives of injured veterans. J Wound Care 2016;25:571-5. Hourani L, Bender RH, Weimer B, Peeler R, Bradshaw M, Lane M, et al. 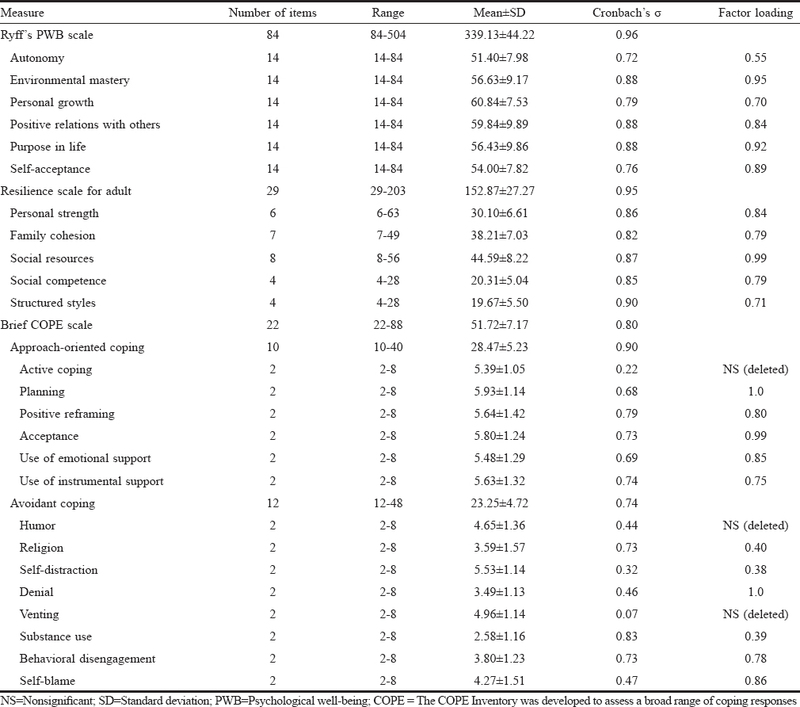 Longitudinal study of resilience and mental health in marines leaving military service. J Affect Disord 2012;139:154-65. Whealin JM, Nelson D, Stotzer R, Guerrero A, Carpenter M, Pietrzak RH, et al. Risk and resilience factors associated with posttraumatic stress in ethno-racially diverse National Guard members in Hawaii. Psychiatry Res 2015;227:270-7. He F, Cao R, Feng Z, Guan H, Peng J. The impacts of dispositional optimism and psychological resilience on the subjective well-being of burn patients: A structural equation modelling analysis. PLoS One 2013;8:e82939. Nurius PS, Green S, Logan-Greene P, Borja S. Life course pathways of adverse childhood experiences toward adult psychological well-being: A stress process analysis. Child Abuse Negl 2015;45:143-53. Kaplan GA, Goldberg DE, Everson SA, Cohen RD, Salonen R, Tuomilehto J, et al. Perceived health status and morbidity and mortality: Evidence from the Kuopio ischaemic heart disease risk factor study. Int J Epidemiol 1996;25:259-65. Kwan YK. Life satisfaction and self-assessed health among adolescents in Hong Kong. J Happiness Stud 2010;11:383-93. Sabatini F. The relationship between happiness and health: Evidence from Italy. Soc Sci Med 2014;114:178-87. Veenhoven R. Healthy happiness: Effects of happiness on physical health and the consequences for preventive health care. J Happiness Stud 2008;9:449-69.